Along the River Nile, there are quite a number of hydrological stations as shown in the basin monitoring network. However, a few key stations have been selected for presentation in the map below to the annual flow patterns along the Nile. The annual volumes are seen to be highly variable across the years apart from flow at Malakal. 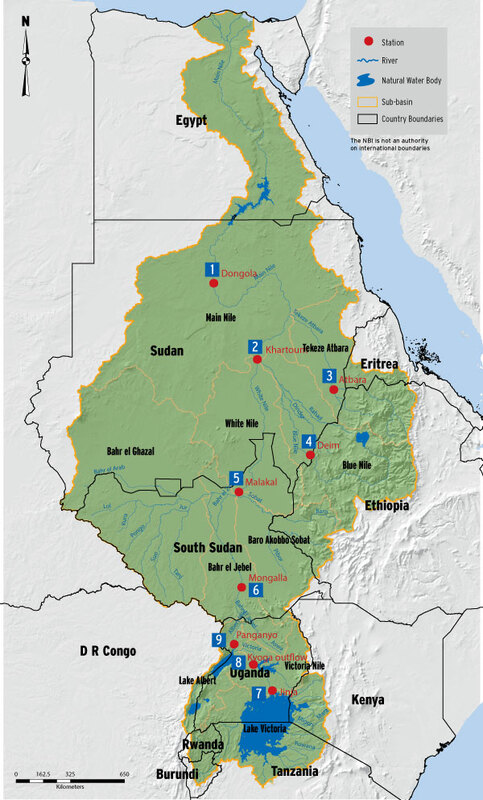 Upstream of the stations White at Malakal, Blue Nile at Diem, where the Atbara tributaries enter the Sudan, the Nile tributaries undergo very little alternations due to man-made interventions. Therefore, the flows at these stations can be considered approximately natural flow conditions. Downstream of these stations the Nile River undergoes considerable changes due to flow regulation through dams and major abstractions for consumptive use. In addition, downstream of these stations, the Nile receives very little flow contributions from surrounding catchments as this part of the Nile Basin obtains very little rainfall.